At a certain point during my family’s annual vacation at the beach, my professorial father would grow weary of body-surfing the waves with his three hyperactive children, and yearn instead for the shade of an umbrella and his stack of Aviation Weekly and National Geographic. ‘If you dig deep enough,’ he’d say to my brother, ‘you’ll dig right through to China.’ Positioning my sister a bit to the north, he’d say, ‘And here you’ll dig to Japan.’ I waited to see where my father would send me; he knew Southeast Asia from his years in Korea. ‘Over there, that’s Thailand,’ he said, pointing toward a mound of sand. It takes a long time to dig to the other side of the world. 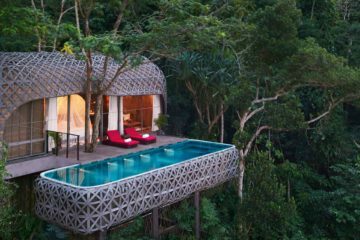 Decades after piling sand on the Delaware shore, I gazed across the turquoise waters of Phang Nga Bay off Phuket Island at a mystical landscape of limestone karsts thrusting up from the sea. Thailand – at last. There are places in this world we know first through our friends. I had one friend who slipped on marble at the Sukhothai in Bangkok and brought home a brand-new nose. 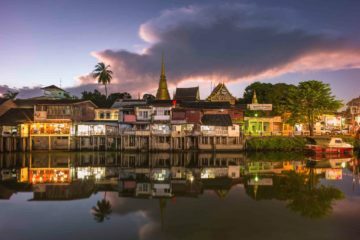 A Greek friend returned to Thailand each year to find a new boyfriend – but this was my first time to the land where Anna snared herself a King. As Lord Byron wrote, ‘To travel in farther Asia is to discover a novelty previously unsuspected and unimaginable.’ For six days, we’d been on a ship, cruising up the Malacca Strait. But now, in a much smaller, rainbow-hued long-tail boat, we sped across the water, whizzing past emerald islets toward a misty blue horizon dotted with vertical outcroppings. Ubiquitous throughout Thailand, the traditional long-tail boat is usually powered by a secondhand car engine, and takes its name from the extended driveshaft upon which the propeller is mounted. Notable for their speed and their pilot’s derring-do, Thai long-tail boats were developed to enable efficient manoeuvring in shallow waters and narrow inlets. Called ‘ruea hang yao’ by the locals, the smaller versions are often used for boat races. I gazed back at our pilot who was seated behind me, his head wrapped in an orange keffiyeh, looking a bit like T.E. Lawrence. He grinned for my camera, steering the boat as effortlessly as an American teenager on Route 66. 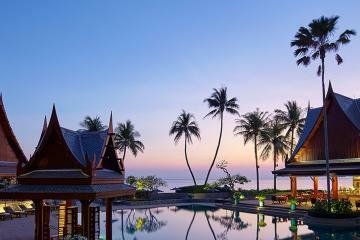 Renowned for its west coast beaches, Phuket Island (the largest in Thailand and roughly the same size as Singapore) is often perceived as a center of indulgent decadence: an Asian amalgam of Miami Beach and Vegas – interestingly, one of Phuket’s sister cities – floating in the Andaman Sea, and overflowing with honeymooners, ‘ladyboy’ shows, discos and go-go bars. 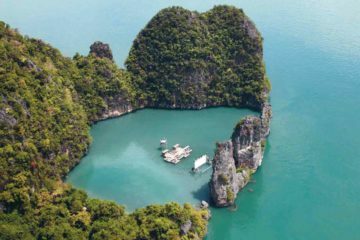 But Phang Nga Bay, located on the island’s east coast, is a protected national park and a sanctuary of islets, cliffs, caves, and diverse cultures. 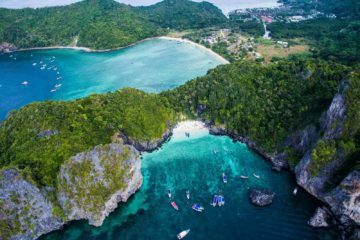 The best-known and most frequented island is Koh Tapu, also known as the James Bond Island (named so for its appearance in the 1974 film ‘The Man with the Golden Gun’), which rises vertiginously out of the sea like a multi-faceted emerald in a marquise setting. As we walked across the water on rough-hewn planks, heading deeper into the floating village, the smell of fish rose up around us. Shaded by tin roofs, cats stretched languidly in the midday heat, oblivious to the birds in gilded cages hanging above their heads. Near the village’s school, a floating football pitch takes pride of place, a testament to the passion of Koh Panyee’s youth, who built a pitch from reclaimed driftwood and, ultimately, became one of Thailand’s most successful soccer clubs. It proves yet again that if you dig deep enough in the sand, if you practice hard enough, you’ll get to where you want to go. Back on the water, zipping over it like a dragonfly at gloaming, we headed back out into the Malacca Strait. Somewhere in the distance, across an enchanted seascape, rose the verdant splendor of the Phi Phi Islands where ‘The Beach’ was filmed, and where drifters still seek their destiny. As the sun set on a vista of blue lagoons and limestone cliffs streaked with mineral oxides, I thought I saw a hawk soaring over the water. I’d seen one before at the floating village, its talons gripping a red plastic chair as it gazed unblinking at the cameras fixed on its face. Now that it was gloaming, now that the tourists had returned to their hotels on the west coast of Phuket, now the ancient rhythms of the sea prevailed. The sea hawk dove, down into the water. I didn’t see him surface again. Perhaps he surfaced on the other side of the world. A long-term New Yorker and a member of New York Travel Writers Association, Mark Thompson has also lived in San Francisco, Boston, Provincetown, D.C., Miami Beach and the South of France. The author of the novels Wolfchild (2000) and My Hawaiian Penthouse (2007), he has a PhD in American Studies and is the recipient of fellowships at MacDowell, Yaddo, and Blue Mountain Center. His work has appeared in various publications.